Needham's collection system conveys an average daily wastewater flow of 5.30 million gallons per day (mgd) from the Town of Needham, which includes approximately 3.48 mgd of infiltration / inflow. On an average annual basis, approximately 66% of the flow leaving the town is sump pump water or ground water leaking into the system that finds there way into the town's 130 miles of sanitary sewers. At certain times of the year, the infiltration / inflow problem is much worse, peaking to an approximately 82% of the flow consisting of infiltration / inflow. Excess water that flows into sewer pipes from groundwater and stormwater is called infiltration and inflow or I/I. Groundwater infiltration seeps into sewer pipes through holes, cracks, joint failures, and faulty connections. Stormwater inflow rapidly flows into sewers via roof drain downspouts, foundation drains, storm drain cross-connections, and through holes in manhole covers. Most I/I is caused by aging infrastructure that needs maintenance or replacement. Infiltration is groundwater, or groundwater that is influenced by surface or sea water, that enters sewer pipes (interceptors, collectors, manholes (MH), or side sewers) through holes, breaks, joint failures, connection failures and other openings. Infiltration quantities often exhibit seasonal variation in response to groundwater levels. Storm events can trigger a rise in groundwater levels and increase infiltration flows. The highest infiltration flows are observed following significant storm events or following prolonged periods of precipitation. Since infiltration is related to the total amount of piping and appurtenances in the ground and not to any specified water use component, it is usually expressed in terms of the total land area being served, or in terms of the lengths and diameters of sewer pipe. The unit quantity used in this study is gallons per acre per day (GPAD). See picture above for a graphical view of the sources of infiltration. 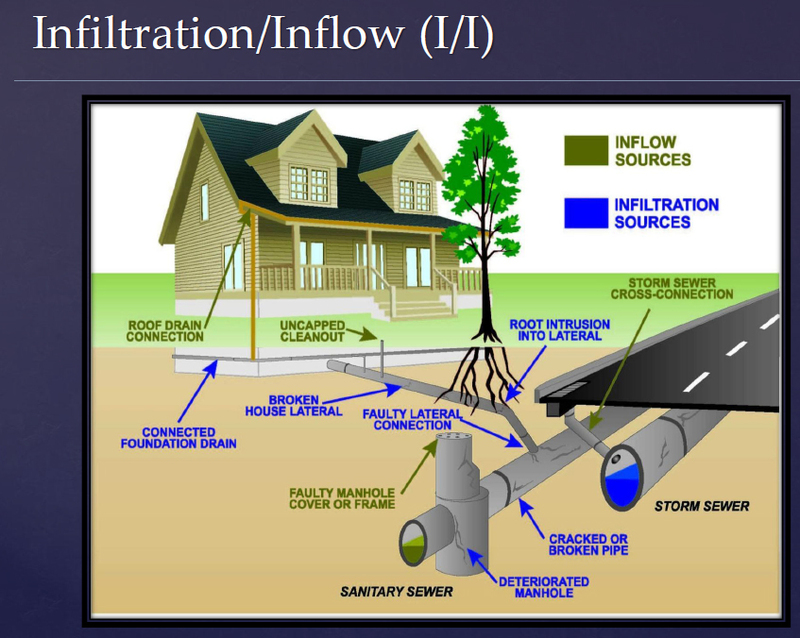 Inflow is surface water that enters the wastewater system from yard, roof and footing drains, from cross-connections with storm drains, downspouts, and through holes in manhole covers. Inflow occurs as a result of storm events such as rainfall, snowfall, springs or snow melt that contribute to excessive sewer flows. Peak inflow can occur during heavy storm events when storm sewer systems are surcharged, resulting in hydraulic backups and local ponding. See picture above for a graphical view of the sources of inflow. Why is I/I a problem? It takes up capacity in the sewer pipes and ends up at the wastewater treatment plant where it must be treated like sewage, resulting in higher treatment costs. These costs are then transferredto you, the user. Requires new and larger wastewater facilities to convey and treat larger volumes of flow, resultingin higher capital expenditures. I/I flows contribute to sewer system overflows into local homes and the area waterways, negativelyimpacting public health and the environment. What is the Town doing to reduce or eliminate Inflow and Infiltration (I/I)? While it is virtually impossible to eliminate all I/I from any sewer system, the Town of Needham has begun a program to rehabilitate the existing system in an effort to reduce the amount of clean water entering the sewer system in an effort to improve system reliability and reduce the costs which residents and businesses pay. How do we locate Inflow and Infiltration (I/I)? Additional methods used to locate I/I include manhole inspection, smoke testing, dyed water tracing, and internal building inspections. How do we remove Inflow and Infiltration (I/I)? There are many methods and technologies available to remove and reduce I/I. Modern techniques allow for the sewer lines to be inspected, cleaned, and even replaced or rehabilitated without traditional open-cut excavation. 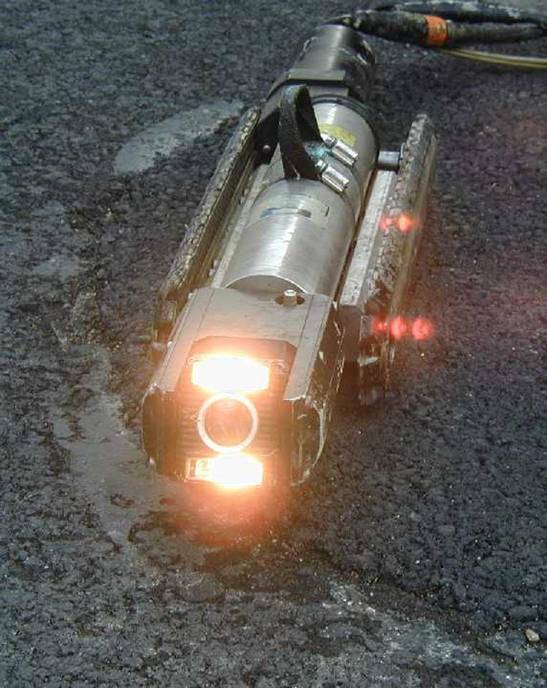 These “trenchless technologies” allow for rehabilitation and repair of sewers without the expense and interruption of conventional open-cut excavation. Not only is it more convenient to employ trenchless technologies to rehabilitate the sewer system, but it is also extremely cost effective when compared to open-cut methods.